When Abraham and Sarah were chosen by God to be the parents of a new nation G-d added a Hebrew letter to each of their names. The Hebrew name reflects a person’s spiritual identity. At any major life event, it is a Jew’s Hebrew name that is used. Our sages teach us that in some way the Hebrew name that parents choose is divinely inspired because later in life the child’s character and demeanor connect to the name. Most often the name is given after a deceased relative, after a righteous person in Jewish history or connected to an event or time of year. Rabbi Becker is available to help parents in choosing the Hebrew name for the Bris/Baby Naming. Because of the spiritual significance of the Jewish name, it is usually given in conjunction with a religious ceremony. For a girl it is most often given when the father of the newborn is called to the Torah . The naming includes a blessing to the parents to effectively raise her and enjoy nachas. There is also a prayer for the baby’s mother that her energy be speedily restored. 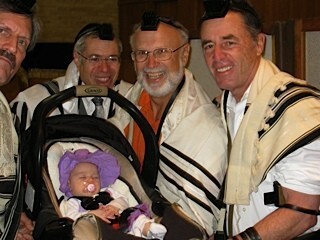 The naming of a girl can also take place as a separate occasion either in the synagogue or at home. For a boy the name is given at the time of the covenant of circumcision. The Brit is the way in which the Jewish people demonstrate their willingness to be joined in partnership with G-d. The circumcision itself is a moving ceremony including opportunities for family members to participate. It is accompanied by a festive meal where the Rabbi speaks about the family and the occasion. The brit is performed on the 8th day of the birth of the baby (precluded by health issues). The person who performs the circumcision is known as a mohel. Every mohel undergoes intensive training both medically and spiritually in order to be certified. He must be thoroughly knowledgeable and experienced in both these areas. Rabbi Becker will assist the family in arranging for an experienced and qualified mohel.